Self storage units are quickly becoming the solution not just for people’s storage needs, but for businesses and hobby needs as well. The versatility of self storage units make them ideal for keeping items that you either don’t have room for or don’t want around your home or office. 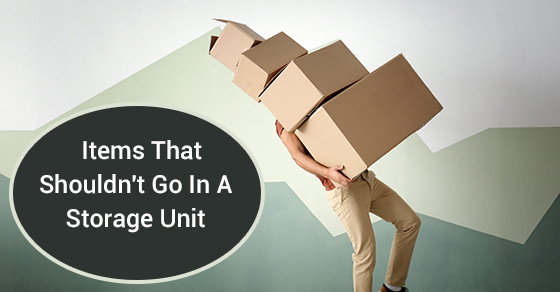 There are, however, certain restrictions on what you can and should keep in a self storage unit. Below are some items that should never be put in a storage unit. One of the biggest concerns for people storing anything is whether or not what they are storing is going to attract pests. While rodents and insects can be attracted to all manner of stored items, you are almost guaranteeing yourself a problem if you start storing perishable food items. Not only will the smell of these items eventually become an issue, but you might open your unit to find it infested and, more importantly, you might end up infesting adjacent units. Anything flammable (such as fuels, oils etc.) should not be put in self storage units. You want to make sure that you are not putting your unit, or those around you at risk and keeping flammable chemicals, or compounds in a hot, confined space is a recipe for disaster. Ask your storage facility for a list of flammable items that you are not allowed to keep in your unit. Even if it is only for a short period of time, you should never put anything living in storage unit. This is not only against the rules of most storage facilities, but it is also inhumane. Storage units are confined, dark spaces that likely not breathe well and keeping something living in such a space is not permitted and not right. As with flammable items, anything explosive is also something to be kept out of self storage units. This includes things like fireworks, propane tanks and anything that could explode upon expansion and contraction due to large swings in temperature. You don’t want to risk damaging your own belongings, those in adjacent units or risk harming yourself or anyone else who enters the unit. Don’t keep explosive items in your unit. Self storage units really have very few restrictions on what you can keep in them, but they do have some. If you are making a list of things to keep in your self storage unit and want to know what you should leave out, keep the above 4 classes of item in mind and make sure you are using your storage space responsibly.